Our inventory is approximately 4 million dollars and with annual sales exceeding $20 million. Expressway leverages its purchasing power by buying in large volumes and in many cases will ship directly from the manufacturers’ warehouse to your facility. Real time inventory control, a small fleet of Expressway owned delivery vehicles, and direct access to the manufacturers’ warehouses ensure prompt delivery of the correct parts. Expressway offers Hino Genuine Parts. Hino Genuine Parts have been designed and tested to meet exacting quality control standards and provide the best value and performance for your Hino truck. 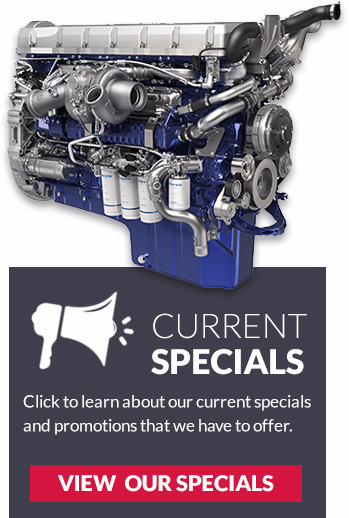 View our current Hino Genuine Special below. Expressway Trucks offers used Volvo and Hino parts for sale. We have a wide variety available at any given time or can help you source a part you need. For more information about our used parts, please contact Jody at parts@expresswaytrucks.com or call 519-632-9777 ext. 238.